Muffin Tin Turkey Cheeseburgers make dinner time a breeze and are fun for the kids! Skip the line at the drive thru and make these delicious burgers instead! 1. Preheat oven to 350° and grease a muffin tin with cooking spray. 2. In a medium skillet, add the olive oil, turkey and onions. 4. Stir in the garlic, green chiles, soy sauce, salt and pepper. Cook for another 2 minutes over medium heat. 5. Using a rolling pin, flatten each burger bun half. 6. Press the bun halves cut side up in the tin. 7. Divide turkey mixture evenly between the bun cups. 8. Quarter the 3 cheese slices into 12 equal squares and place one on each burger. 9. Cook in the oven for 10 minutes or until buns begin to brown and cheese is completely melted. 10. Remove from oven and place a pickle chip on top of each burger. Serve with your favorite toppings. 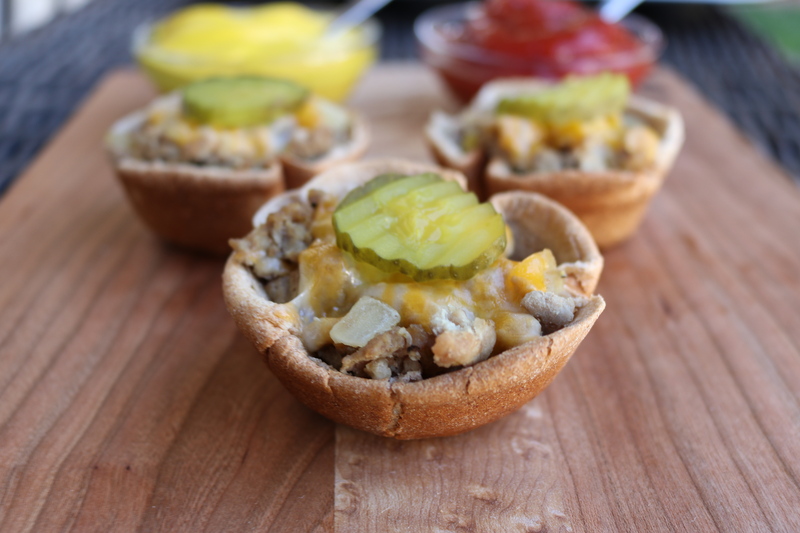 Muffin Tin Turkey Cheeseburgers make dinner time a breeze, are fun for the kids and are easy! Skip the line at the drive thru and make these delicious burgers instead! Preheat oven to 350° and grease a muffin tin with cooking spray. In a medium skillet, add the olive oil, turkey and onions. Cook until turkey is browned. Stir in the garlic, green chiles, soy sauce, salt and pepper. Cook for another 2 minutes over medium heat. Remove from heat and set aside. Using a rolling pin, flatten each burger bun half. Press the bun halves cut side up in the tin. Divide turkey mixture evenly between the bun cups. Quarter the 3 cheese slices into 12 equal squares and place one on each burger. Cook in the oven for 10 minutes or until buns begin to brown and cheese is completely melted. Remove from oven and place a pickle chip on top of each burger. Serve with your favorite toppings. This recipe also works with ground beef. Use any kind of cheese and hamburger bun.